NEW YORK — Call it the final frontier of mail: To celebrate the 50th anniversary of the iconic science-fiction series "Star Trek," the U.S. Postal Service unveiled a new set of Forever stamps Friday (Sept. 2). The new stamps were revealed just ahead of the Sept. 8 anniversary of the show's debut episode in 1966. 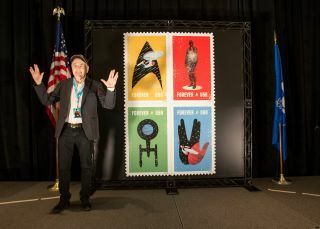 A first-day-of-issue ceremony for the stamps kicked off the beginning of Star Trek: Mission New York, a three-day-long celebration happening at New York City's Jacob K. Javits Convention Center. "For more than 50 years, 'Star Trek' has entertained us, engaged us and taken us on a tremendous journey, inspiring optimism and a better understanding of the American psyche," Megan J. Brennan, postmaster general and CEO of the U.S. Postal Service (USPS), said during the ceremony. The U.S. Postal Service issued these Forever stamps to celebrate the 50th anniversary of the "Star Trek" premiere, which debuted on Sept. 8, 1966. Other speakers at the ceremony included actor and humanitarian Walter Koenig, who played USS Enterprise Navigation Officer Pavel Chekov in the original series, and Michelle Thaller, NASA's deputy director of science communication. "I'm so old, I remember when you had to use your tongue to mail a letter," Koenig said, according to StarTrek.com. "I've always liked seeing the word 'Forever' on a stamp. It says to me we'll still be around, and for a long, long time." The new stamps were designed by artists Jason Kernevich and Dustin Summers. "Our process was to create imagery that speaks to the iconic quality of the 'Star Trek' series and its vast visual language, as well as alludes to the aesthetic of 1960s science fiction," the artists said in a statement on StarTrek.com. The stamps can be purchased in USPS officesor online here. Because they are Forever stamps, they will "live long and prosper," and will always be valid for mailing First Class letters, regardless of the current postal rate.